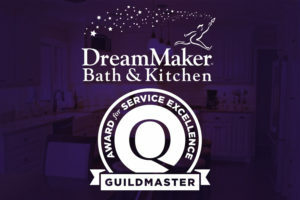 Congratulations to the six DreamMaker® Bath and Kitchen home renovation franchise owners who recently received Guildmaster Awards from GuildQuality! The awards perfectly demonstrate the level of service our franchisees and their teams can deliver to clients by utilizing the services and support of our renovation franchise. GuildQuality is an independent customer satisfaction surveying company focused on the remodeling, homebuilding and home improvement industries. In order to qualify for the Guildmaster Award, a Guildmember has to earn a customer recommendation rate of 90% or greater while reaching a specific response rate threshold. We’re proud of our franchisees for operating to such high standards. The Guildmaster Awards are based on customer satisfaction surveys conducted through GuildQuality. Including this year’s honorees, 13 DreamMaker® Bath and Kitchen franchises have received the Guildmaster Award over the past three years. DreamMaker® Bath and Kitchen as a company is a two-time recipient of the Guildmaster Award for Service Excellence. We’re a company that strives every day to provide exceptional service, because we fully believe that’s the best way to become successful. Live and serve with integrity, and clients will recognize that, appreciate that and trust you with their business. 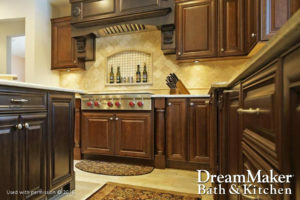 The remodels performed by DreamMaker® Bath and Kitchen renovation franchise owners consistently earn rave reviews, positive word-of-mouth and repeat business from clients. These awards not only validate the excellent work performed by our franchisees and their teams, they also add to their credibility with clients. That helps close more deals and increases lead flow as clients choose a recognized, trusted name for their remodels. Better still, these awards come directly from feedback from satisfied clients. When a client finds a remodeler they can trust, they spread valuable word-of-mouth to friends and family, which translates into new business for you. It can directly lead to repeat business, as well; while we focus primarily on bathroom and kitchen remodeling, franchisees can use our systems and their own talented teams to expand their capabilities as full-scale remodelers, enabling them to take on more jobs. For in-depth details about DreamMaker® Bath and Kitchen renovation franchise, download our free franchise report and start a conversation with us. You also can learn more by visiting our research pages.